Germany's Pascal Wehrlein is to drive for the Manor team in 2016. The 21-year-old, who was the reserve driver for Mercedes in 2015, takes the first of two vacant Manor seats. Wehrlein won the DTM German Touring Car Championship in 2015 and has experience of driving F1 cars in testing. "Pascal is a sharp driver with a very promising future," said Manor boss Stephen Fitzpatrick. "We've chosen a driver with the talent and hunger to match our ambitions." 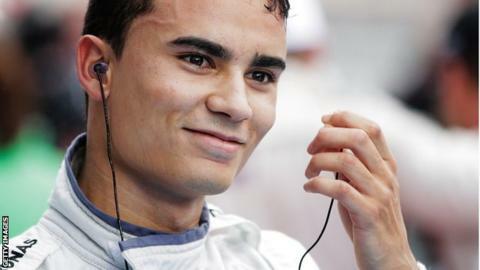 Wehrlein, who has a deal with Manor for the entire season, said: "Manor Racing is a great place for me to start my F1 racing career. I'm very pleased to be here. "It's a small and totally focused team and I soon hope to know everyone. "Though it's my first F1 season my aim is to help Stephen and the guys achieve their goals. It will be a tough challenge but I think we should be able to challenge for points along the way. It's going to be good fun." Wehrlein also thanked Mercedes F1 boss Toto Wolff, who helped engineer the move as part of Manor's new engine partnership with Mercedes. Alexander Rossi and Will Stevens, who drove for Manor in 2015, and Indonesian rookie Rio Haryanto are all in the frame to partner Wehrlein. Wehrlein's opportunity for increased experience in F1 comes amidst uncertainty over the future of Mercedes driver Nico Rosberg, whose contract expires this year. Wolff has said he will make no decision on Rosberg's future until he has seen the first part of the 2016 season. If Rosberg continues his current high level of performance and the relationship between the German and three-time world champion Lewis Hamilton remains manageable, Mercedes are likely to retain Rosberg, at least for one more year. But giving Wehrlein some experience increases their options. They are also keeping an eye on Daniel Ricciardo and Max Verstappen, both of whom are under contract to Red Bull beyond the end of 2016. Verstappen's deal runs until the end of 2017, while Ricciardo's lasts for a year longer. They have struggled at the back of the grid since entering F1 in 2010 but have undergone a major restructure in an attempt to improve. Team founder John Booth and president Graeme Lowdon left at the end of last season after agreeing future plans with Fitzpatrick, who saved the team from oblivion by buying it in early 2015. Fitzpatrick has recruited experienced former McLaren sporting director Dave Ryan as racing director to run the team. He has also brought in leading technicians Pat Fry and Nikolas Tombazis, design engineers sacked by Ferrari at the end of their winless 2014 season.